With hard disk drives, both speed and size is important. In terms of which brand to use it really depends on what you are going to use it for. If you are going to use the drive to hold important data then it is probably best to use a leading brand name. Some offer lengthy warranties incase of failure. For SCSI, Firewire, and Serial ATA drives, you may need a separate interface card although most modern PCs have USB & Firewire ports now. However the hard drives are more expensive, but faster than IDE drives. Often they are external hard drives as well which means they are great for backups as they can be stored elsewhere. In addition, thanks to the special interface the data transfer rate is higher (66 MB/sec, 100 MB/sec, or 133 MB/sec). 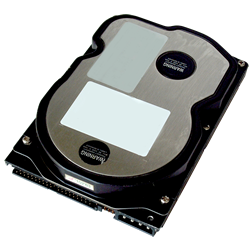 Serial ATA (SATA) drives are the newest type of hard drive and promise transfer rates of 150 MB/sec or more when used with a native serial bus controller.